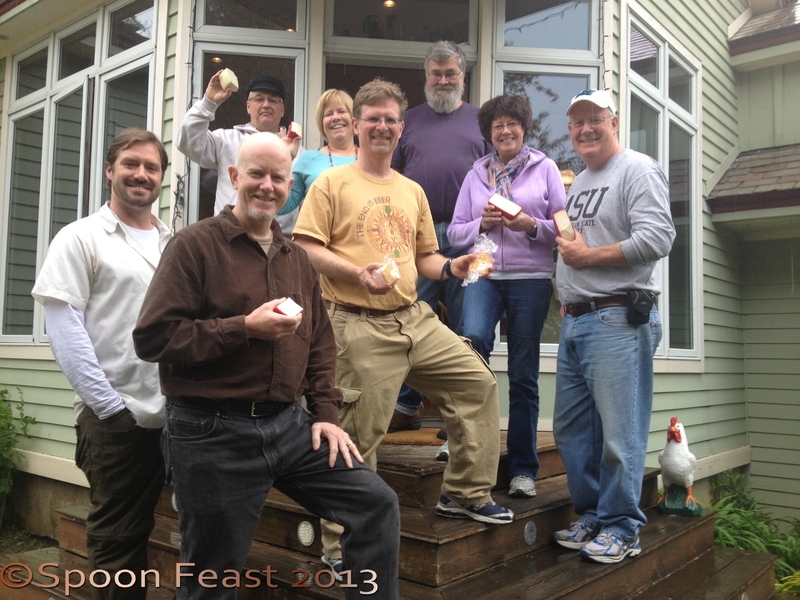 This past weekend two of my colleagues and I got to travel to Shelburne Falls, Massachusetts to take a Cheese Making Workshop conducted by cheese master Jim Wallace. We learned about the processes of making Cheddar, Camembert and Vacha Toscana, about a lot of the science, theory and instinct involved in cheese making as well as an evaluation of the cheese each of us brought for him to trouble shoot. We had a great group: Seth from Vermont/New York, Martin from St. Augustine, Michael and Belinda from Pennsylvania who want to buy a boat soon and sail the eternal summer; two of my colleagues and myself. 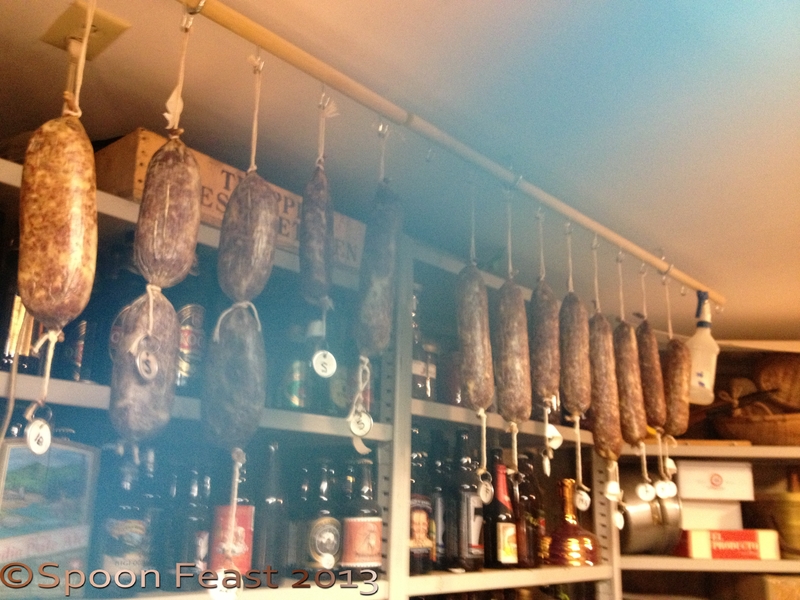 Each of us have tinkered with cheese for a few years and this workshop allowed us to take our skills to another level. 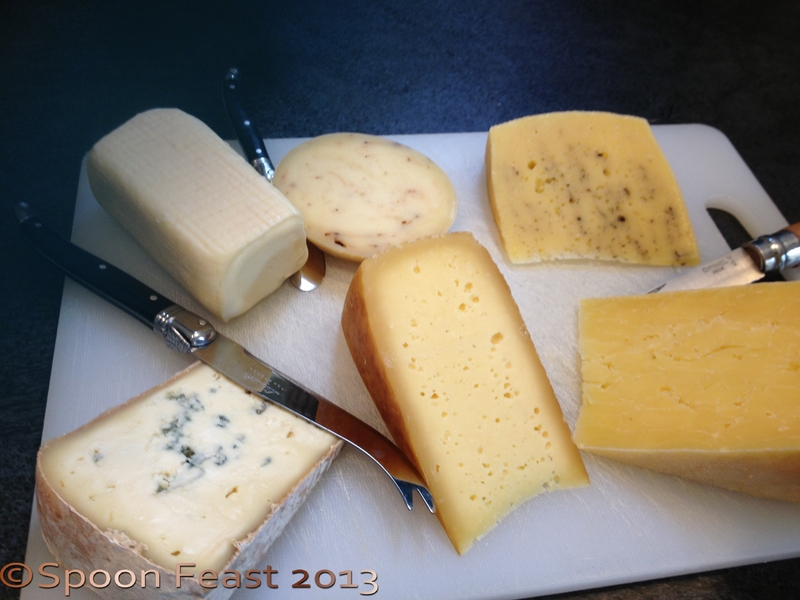 I hope we can stay in touch somehow, I want to hear about the cheese making adventures at sea! Jim’s cheeses are not only beautiful but very tasty. 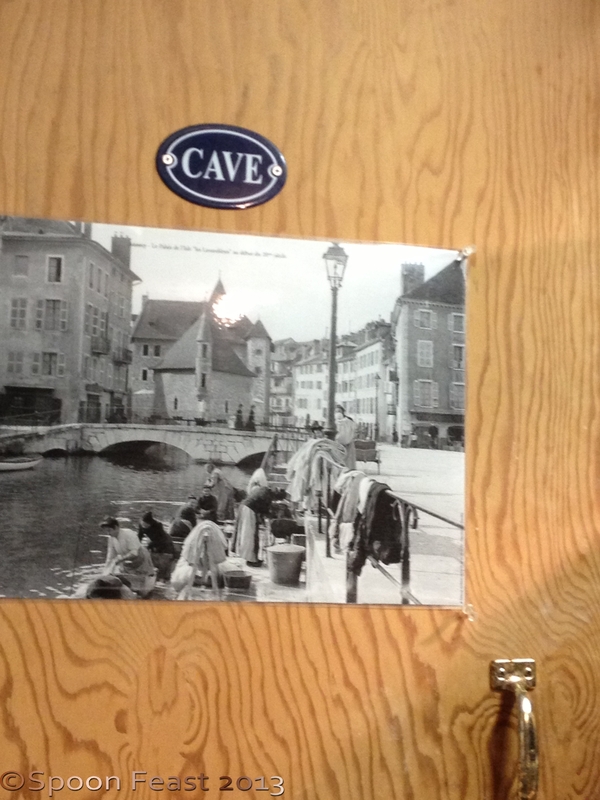 His “Cave” and drying rooms are places I could spend hours. 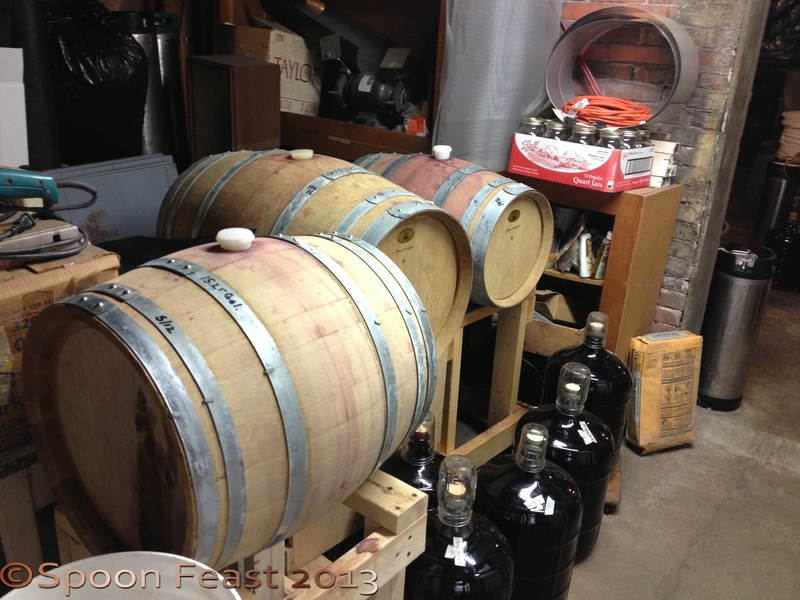 In addition to making cheese, Mr. Wallace also makes some lovely wine and impressive beer. draining, molding and finally pressing. 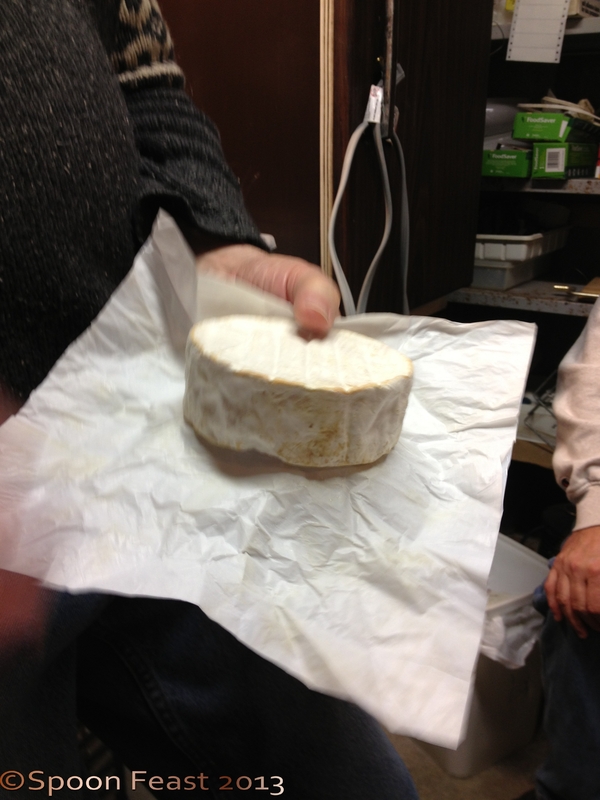 I was amazed how easy it seems to be to make Camembert. Can’t wait to try it! Sunday morning, Robin and Jim were making fresh butter from the butterfat that floated to the top of the whey from Saturdays cheese making. Really fresh butter! Boy did that butter taste good! 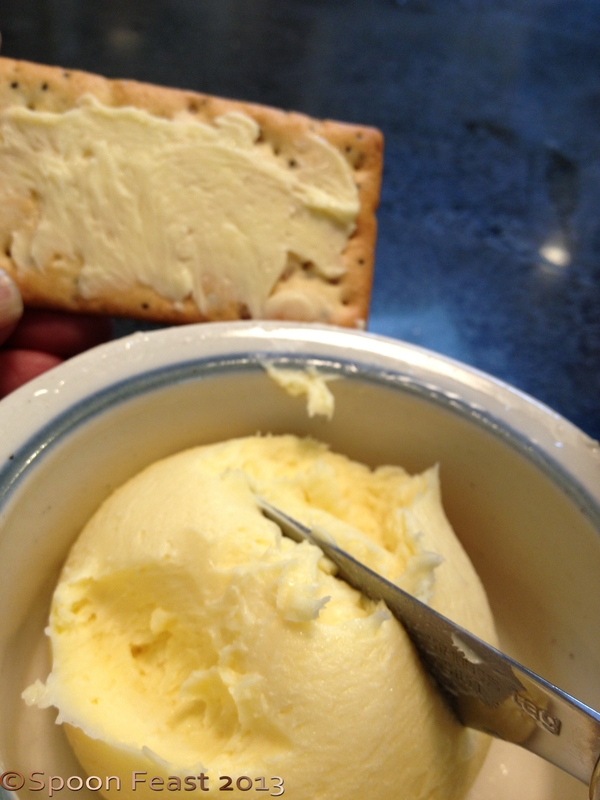 Really fresh butter and you know how much I love butter! Both Jim and Robin were professional photographers who traveled and sold their work at shows. This resulted in an amazing collection of original art work from photographs of their own and others, sculpted art pottery, bead work, and dinner/serve ware style pottery. It was great to be in the presence of so much creative energy. 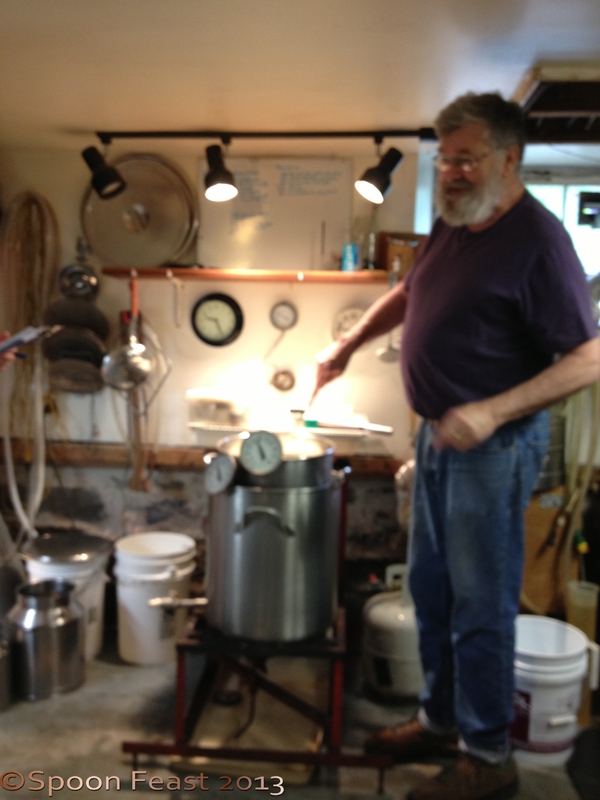 Jim works with Ricki Carroll of The New England Cheese Making Supply on development, workshops, recipes and website. 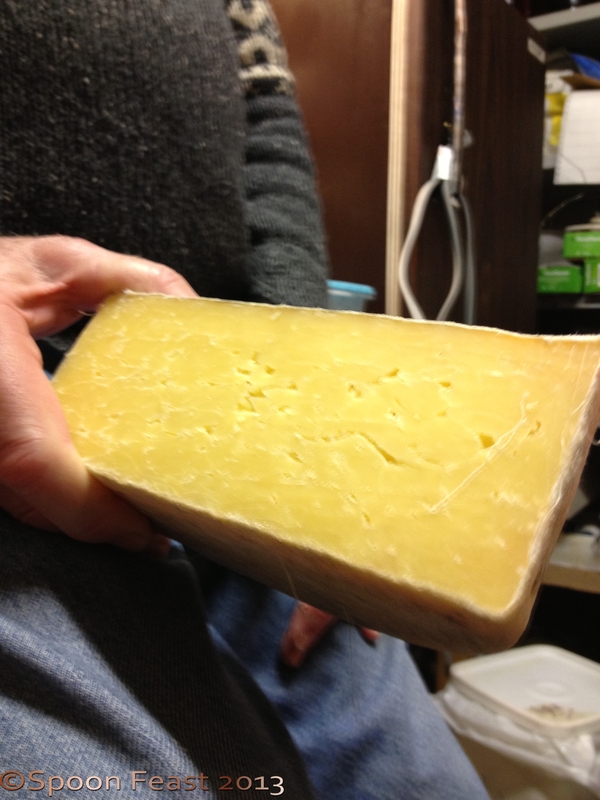 If you have any interest in cheese making, I highly suggest you get in contact with Jim to see what he has coming up. He has limited space so make you plans early. You can contact him at jim@cheesemaking.com. He can give you the cost, dates and availability of up coming workshops. I would say these aren’t for someone who has never made cheese before because he gets quite technical. If you never made cheese before, find a local class that teaches mozzarella, marscapone, lemon cheese, cream cheese and other quick, easy fresh cheese. 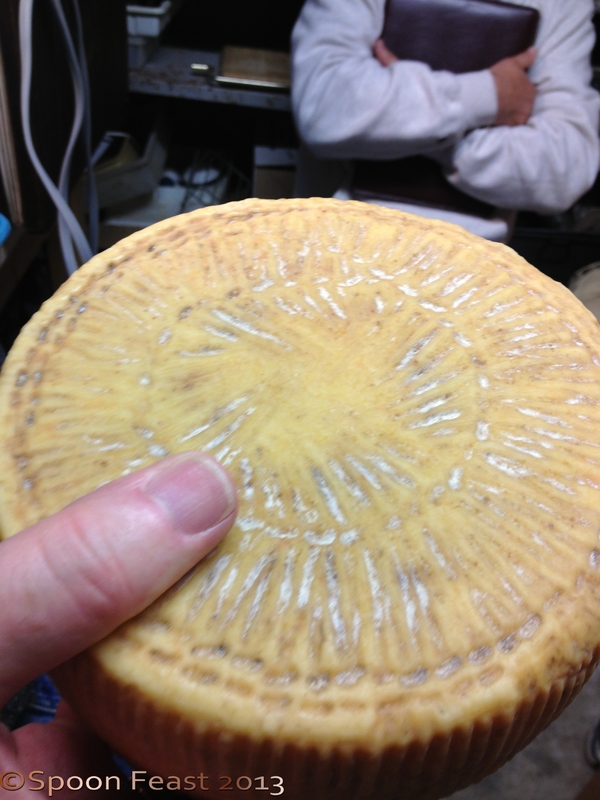 If you like the process, play with making a couple aged cheese, THEN go take a workshop from Jim. Bring your cheese with you and he will tell you what you did right, what went wrong and give great advice about your cheese. Everyone got a lot out of this session. 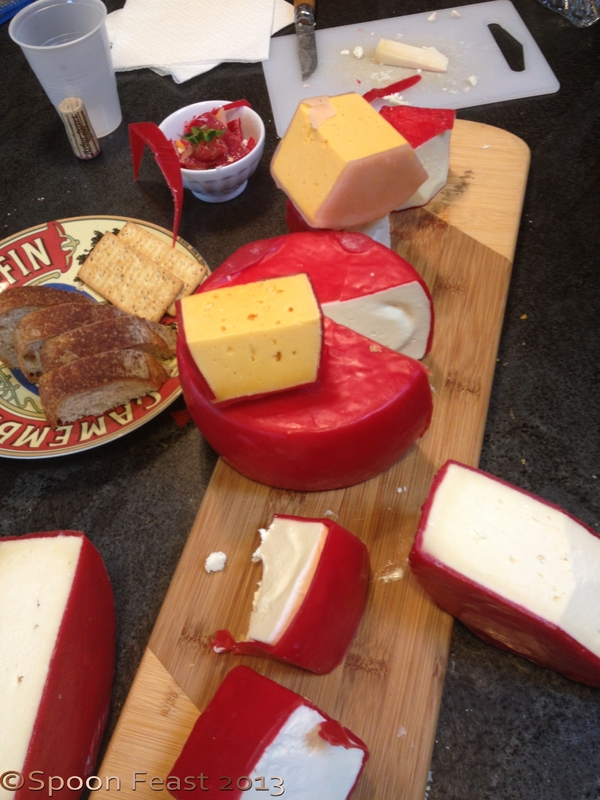 I will create posts on the cheese we made and the cheese we make now that we are back from the workshop. It will be quite fun and interesting to get to make these. The challenge will be in allowing them to ripen and age enough before cutting into them. Some age for a couple of weeks, and others several months, We think once we get the process started, we can have a perpetual flow of amazing artisan and farmstead cheese. Watch for these posts over the summer! If you take a workshop from Jim, let me know what you get to make as his workshops are all different. We guess it depends upon what his cave needs and his social schedule as he always brings cheese. You’ve got to pace yourself though, it is easy to get cheesed out if you don’t normally have a lot of cheese in your diet. Jim’s cheese we tasted at lunch. The Bavarian Feta (rectangle cheese top left) is my favorite! This entry was posted in Cooking, Teaching Culinary School, The Life of a Chef and tagged artisan cheese making, camembert, cheddar, Cheese, Cheesemaker, farmstead cheese making, making camembert, making cheddar, making rustic cheese. Bookmark the permalink. What an awesome experience, my friend, cheese making sounds like so much fun! We had a blast! Can’t wait to make and then taste our creations. Great blog and article. Thanks also for referencing my blog. I will follow yours, it looks interesting! I love cheese and Wisconsin is full of it. Have a great day! Thanks! I bet Wisconsin has some amazing artisan cheese makers there. I look forward to exploring your blog and thanks for following mine! Thanks! We have award winning cheese here 🙂 I still need to flesh things out on my blog (only been 3 months), but I have been a cook professionally since 1989. Not as high a level as you but it’s made me a living. This blog is my creative outlet for my other passions, writing and photography. Have a great day! Can’t wait to sample yours, I’m sure it will be wonderful! It’s a hurry up and wait project as they need to age a bit. 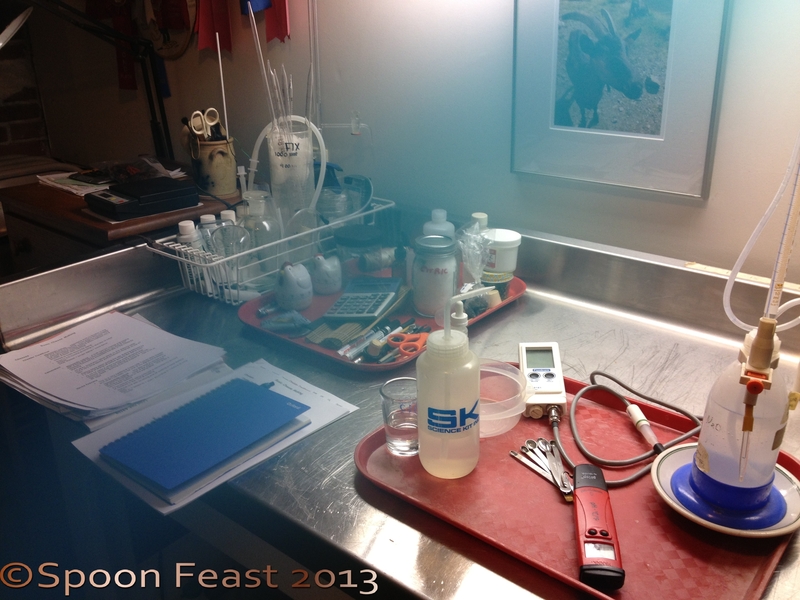 But the sooner we get started, the sooner we get tasting! 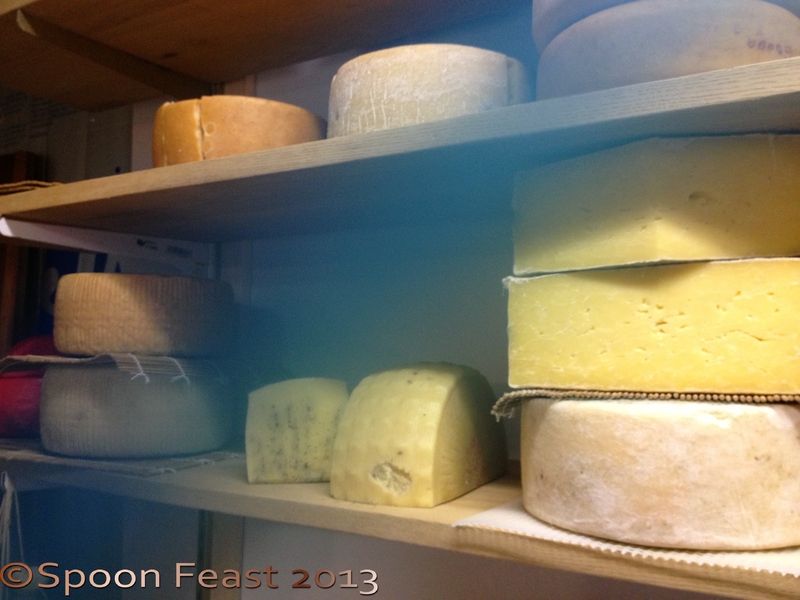 Can’t wait to taste you cheeses, I’m sure they’ll be wonderful! I certainly hope so, but we need to leave that ‘margin of error’ factor. Learning curve. . .
Oh my, does this ever look like fun!